Volunteers are a critical part of how Treehouse supports youth in foster care. We welcome groups, individuals and families to join us. Treehouse’s commitment to diversity and equity is central to our work with youth in foster care, and our volunteers are our partners in this work. Treehouse serves youth and caregivers of many races and ethnicities, sexual orientations, gender identities, abilities and religious beliefs. We seek volunteers who reflect that diversity. We know that everyone is at a different place in their learning about dismantling racism and other forms of oppression, but our expectation is that Treehouse volunteers bring a personal commitment to continued learning and action on these fronts. Want to join us? Please view our volunteer opportunities below. We look forward to working with you. 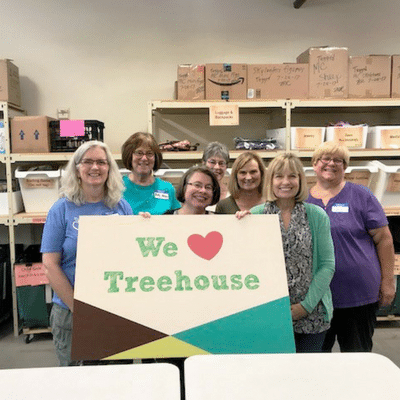 Treehouse welcomes groups of volunteers year-round. 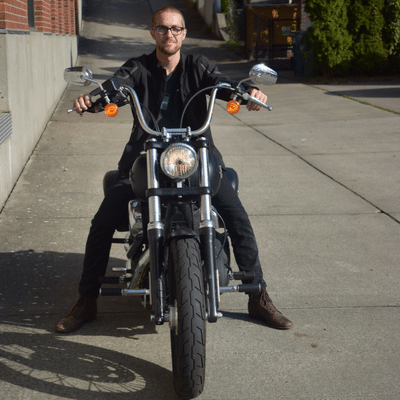 The primary way we utilize groups is in our free store for youth in foster care, which is located in South Seattle. 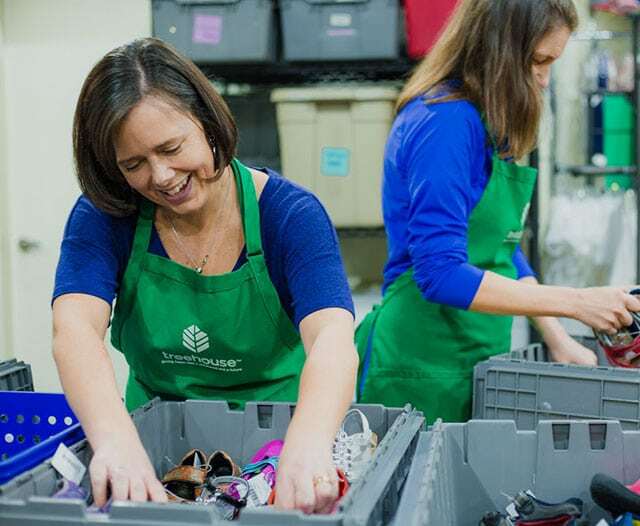 Groups work together on projects like sorting and processing incoming donations, putting tags on clothing, and preparing the store for shopping days. It is a great way to do some teambuilding, and we make sure everyone learns about Treehouse and has a chance to go on a tour of the store during their time with us. Group Size: We are able to accommodate groups of 5-15 people per shift. Youth must volunteer with adults. Our youth to adult ratio is 4:1, and adults are included in the headcount. How to Register: It is easy to view our open shifts and request a reservation for your group online. Step 1. Click here to go to our volunteer site. Step 3. Any shift with one spot open is available to be requested by a group leader. Click the Sign-Up button. Once you request a shift, a Treehouse representative will contact you to get your group’s information. We will provide you with confirmation details and a registration link to share with your group members. Each volunteer must register separately at least 48 hours in advance of your shift. Volunteers who have not registered will be turned away. *Occasionally we will have other group projects, which can be found by filtering for “Group Special Events”. We have a variety of volunteer opportunities throughout the year that allow individuals to help us with events or during our peak seasons (back-to-school and the holidays). How to Register: It is easy to view our open shifts and sign-up online. Step 2. Browse opportunities using the filters listed. Step 3. Please be sure to read through the event details, and note any age requirements. Click the Sign-Up button. Each volunteer must register separately. Volunteers who have not registered will be turned away. Individuals or groups of professionals can help move our work forward by providing services such as consulting, pro-bono support, translation, trainings, grant writing, graphic design, tech support, retail merchandising consulting and more. We keep an eye out for upcoming needs that might make a good skills-based project for volunteers. This a great way to engage volunteers in a capacity that fully leverages their expertise. Our process is to identify projects and then match them with people from our pool of skills-based volunteers. If we have a project that looks like it is a good fit for you, we will reach out with project details to see if it is something you would like to work with us on. One of the ways volunteers support youth in our Graduation Success program is by serving as job shadow hosts. When youth express an interest in a specific career, we can connect them with a volunteer in that field who is willing to host them for a job shadow experience. The student and their Treehouse Education Specialist will spend 2-3 hours at your workplace to learn more about what you do and what your career path looked like. 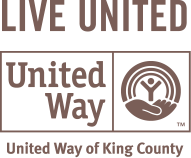 The job shadow program is currently limited to King County, but we would love to start growing our list of prospective volunteers in Pierce, Spokane and Snohomish counties as well. How to Register: Click here to complete our Skills-Based Volunteers & Job Shadow Host Form. Our service projects for high school students bring students from different schools together to volunteer and support youth in foster care. Volunteers sort donations and prepare merchandise to go into Treehouse’s free store for youth in foster care. Our high school shifts allow youth to volunteer without an adult. Minimum Age: Youth must be a current high school student (during summer months rising 9th graders are welcome to participate). Frequency: We try to offer two shifts per month. How to Register: Click here to view upcoming shifts and register online. All spots are available on a first-come, first-served basis. Each volunteer must register separately. Volunteers who have not registered or do not bring their signed Parent/Guardian Authorization Forms will be turned away. This event series is designed with small families and groups in mind. If you don’t have the five people required to reserve a group shift in our free store, this is the opportunity for you. These shifts allow several families and/or small groups to share a group shift to come volunteer with us in the store. (Individuals can sign-up, too.) Volunteers contribute by processing incoming donations, preparing merchandise to go into the store and getting the store ready for shopping days. Youth under 16 must volunteer with an adult. Frequency: We try to offer an event every other month. All spots are available on a first-come, first-served basis. Each volunteer must register separately. Volunteers who have not registered will be turned away. 1. Apply: As a prospective ongoing volunteer, review our roles below and then CLICK HERE to complete our online interest form. 2. Standby: We will review applications on a weekly basis and a Treehouse representative will contact you to let you know the status of your application and next steps. Your interest form will remain active for six months. If we have an open position that looks like it is a good match for you, we will send you the details for our upcoming Volunteer Orientations. 3. Activate: Attend an orientation, pass a national background check and get started! 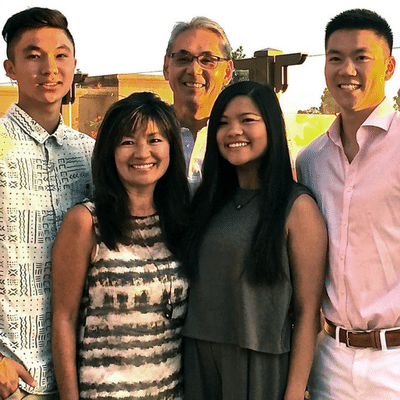 Ambassadors help build a network of support through educating the community about foster care and Treehouse. Ambassadors represent Treehouse at community events, give presentations about our work and engage their personal network in fundraising activities, community outreach, volunteerism and events. Front Desk Volunteers are the face of our organization and vital to our office operations in Seattle! Front Desk Volunteers make a positive first impression with clients, donors and other guests visiting the office, answer incoming phone calls, and provide administrative support for our programs. This position is ideal for a volunteer with excellent phone etiquette, great customer service skills and basic knowledge of Microsoft Office and Outlook. Our Graduation Success program matches volunteers to work one-on-one with middle and high school students by providing academic support in the area they need it most. Students request volunteers to help with tutoring, homework help, credit recovery support, senior project help, and more. Whenever possible we try to factor race, ethnicity, gender, and/or sexual orientation into the equation when matching students and volunteers. It is incredibly valuable for youth in foster care to work with volunteers with whom they can identify. People of color and Spanish speakers are strongly encouraged to participate. Holiday Magic is a seasonal program that provides youth in foster care across Washington State with a meaningful gift during the holiday season. This role is best suited for volunteers with top-notch customer service skills and who feel comfortable working with Excel spreadsheets. Volunteers answer incoming calls and assist caregivers and social worker trying to submit requests, transcribe new voicemail messages and return calls, ensure accuracy of shipping information, call to make sure gifts have arrived and conduct surveys for program evaluation and more. Each year, more than 2,000 youth come to shop for clothes, toys, school supplies and more in our free store, The Wearhouse. Volunteers make it possible for us to maintain consistent store hours and provide a high-quality shopping experience to youth and caregivers. Volunteers with shifts on Tuesday, Thursday and Saturday help when the store is open. Their work frequently includes helping shoppers find items, maintaining store displays, restocking items and running checkout. Wednesdays and Fridays are dedicated to organizing the backstock inventory and resetting the store for the upcoming shopping day. Volunteers’ projects include creating and restocking displays in the retail space, putting incoming items away in backstock and helping with seasonal projects. • Tuesdays from 10 a.m.-1 p.m. and 1 p.m.-4 p.m.
• Wednesdays from 1 p.m.-4 p.m. and 5 p.m.-7 p.m.
• Thursdays from 10 a.m.-1 p.m. and 1 p.m.-4 p.m.
• Fridays from 10 a.m.-1 p.m. The Young Professionals Board (YPB) is comprised of a select group of emerging leaders representing a diverse range of professions and affiliations. Our mission is to build a culture of philanthropy as ambassadors for Treehouse. The YPB carries out its mission by focusing on three pillars: Community Engagement, Ongoing Education and Marketing and Advocacy.